Here are some of the best Advertising networks you can work with. 2.1.3 How to start with Bidsopt? 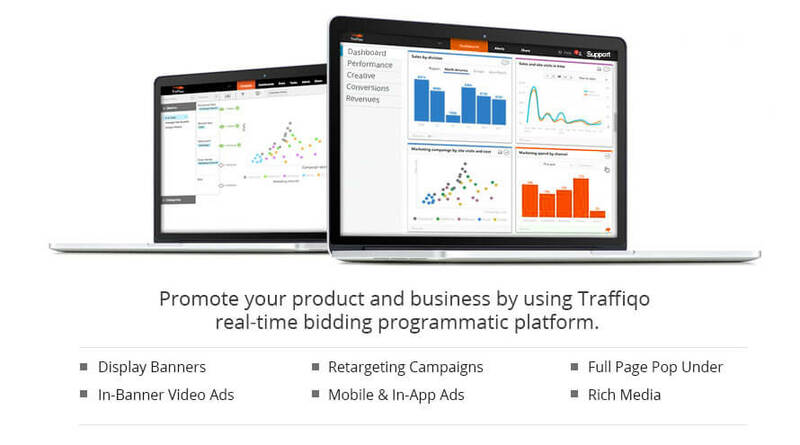 Traffiqo is an OpenRTB SSP/DSP ad exchange platform for advertiser and publishers. 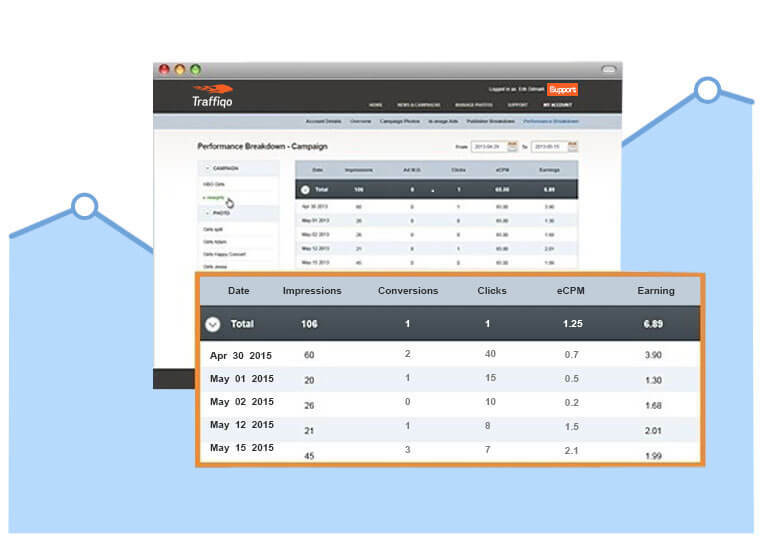 It is an intelligent campaign automation technology where Traffiqo’s cutting edge technology help you to get higher conversion in the same budget by increasing the ROI. In real time, they have around 1200 active campaigns serving around 80 Billion Impressions Worldwide. This includes over 27 Billion daily impressions from over 67605 websites. From these figures, it is clear that it is one of the top networks to work with. Now let’s talk about some of the important and helpful features of Traffiqo. Here are some of the amazing features of Traffiqo which have helped them to become one of the top choices of both advertisers and publishers. • Reporting Dashboard: No need to guess how visitors have found you. See clear reports of the impressions and clicks per domain. • Multi-channel Targeting: Just by joining Traffiqo, you will have Direct access to over 80+ ad exchanges and ad networks. Traffiqo verticals provide the advertisers a variety of channels, including branding, gaming, dating, video and mobile. You will have access to different ad format and sizes with Traffiqo. Below are some of the major ad formats and size, you will have access. It is best if you have good traffic and high-quality traffic. If you have video related sites, it is best. If you have a viral site then this is best for you. Also, in all the formats, you will have different sizes available easily. Do some A/B split testing and select the one which gives you better ROI. This is one of the best features that I liked with Traffiqo. 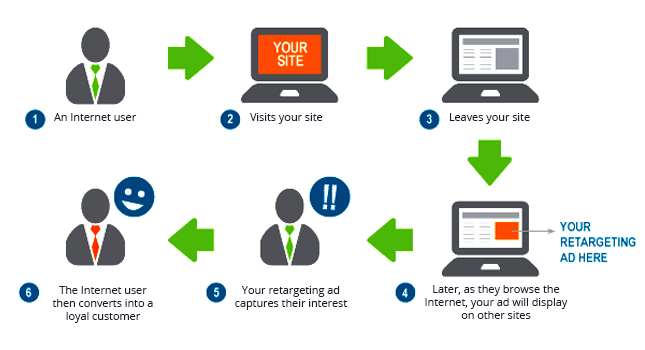 You can retarget your visitors and get them again as a customer. Here are some additional features for Publishers. You can monetize your content and videos with Traffiqo. Partnering with Traffiqo Publishers Program enables you a smooth and rapid entry into new global markets. You can sign up as a publisher through this publisher link. Traffiqo is one of the best networks to join as a publisher. They have all kind of CPM, CPC, POP offers and pays you on NET30 payment basis. You can receive payments through PayPal, Wire, and Cheque. Bidsopt is a mobile demand-side platform which connects advertisers and users in real time. It is a demand Side Platform which enables advertisers to reach the right audience with advanced targeting and performance optimization techniques. The business model of Bidsopt is very transparent to help advertisers to know the percentage of the total CPM cost that actually goes to the inventory bid and how much this can impact return on investment. So, if you are an advertiser and looking to reach right kind of audiences, then Bidsopt is for you. They will help you to reach right users anytime. Their cutting edge technology enabled platform helps you to drive high-quality installs at scale, generate increased brand awareness and amplify real-time mobile performance results. The DSPs allows users to optimize based on set Key Performance Indicators such as effective Cost per Click (eCPC), and effective Cost per Action (eCPA). DSPs creates a unique opportunity for advertisers to truly control and maximize the impact of their ads. • Large Scale Native, Rich Media, Video and Standard Banner inventory from leading exchange/SSP and direct publisher relationship. 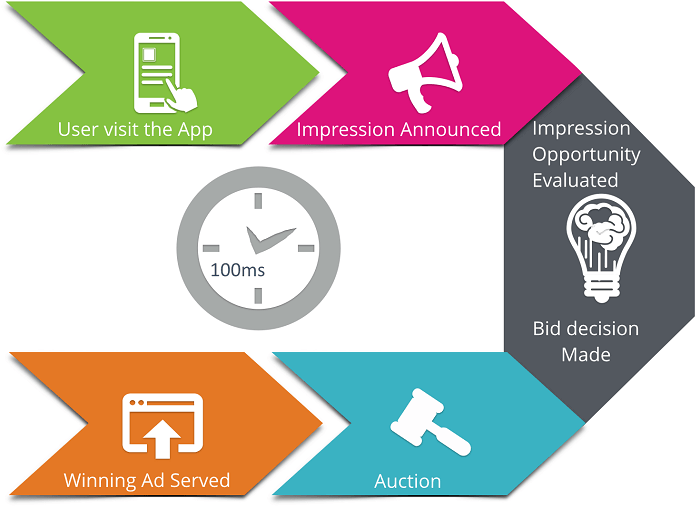 • Real-time bidding: The ability to price and deliver on a per-impression basis in real-time; IAB OpenRTB 2.3 spec and Native Ads 1.0 spec compliance. • CPM and CPC Billing. • Machine Learning and Optimization: Bidsopt’s decision engine optimizes campaign performance based on click through rate and conversion on publishers to maximize performance. • Uses machine learning predictive algorithms and Big Data analysis. • Identifies and targets high-quality mobile users in real-time. • Gain programmatic access to leading mobile exchanges. • Choose desired pricing model from options including CPM and CPC. • Optimizes mobile campaigns based on data points from historical analyses, real-time information, and predicted campaign outcomes. Apart from all these technical features, there are few more which helped them to be the top choice of advertisers. DSP is a system that allows buyers of digital advertising inventory to manage multiple ad exchange and data exchange accounts through one interface. The above infographics show how the cycle works on Bidsopt platform. It allows users to optimize their campaigns by effective Cost per Click (eCPC), and effective Cost per Action (eCPA). With the help of Big Data Analysis, Bidsopt DSP identifies and targets high-quality mobile users your searching for, in real-time. It also helps you to target across multiple RTB exchange and direct publishers. You will also be getting access to leading mobile exchanges across the globes like Mopub, Smaato, Axonix, and Mobfox etc. You don’t have to keep the fixed pricing and bid for all. You may control your CTR and Bids on CPM on the Exchanges. Also, you won’t be paying for unqualified leads or any kind of leads those the platform will identify as suspicious. Bidsopt values your money and has a complete system to detect such issues. This is the unique feature I found with Bidsopt. Usually, you will hear that someone if just spending a penny to get the lead while other has to spend in dollars to get similar kind of lead. Yeah, this is the issue with many advertisers. Ads and campaigns are all about optimization. The better you optimize, the greater result you will get. The USP I found with Bidsopt is, they provide auto optimization features to optimize your campaign based on multiple data points from historical analyses, real-time information, and predicted campaign outcomes. As in the last section, we talked about auto optimization features of Bidsopt. Here is some additional resource to optimize your campaign to get higher ROI at the correct price. All you need to do is, just make sure of the below factors and you will see the sweet result for sure. Geography: Choose country and location, latitude-longitude or target the user with specific IP list. Device: Choose the brand and model among Mobile/Tablet. Carrier Targeting: Target your campaign for specific Mobile Carrier or between Wi-Fi and Carrier Traffic. The conclusion is, just select only those which you need. For example, you are targeting a specific city of a country. Like you are targeting Chicago of USA so just run your campaign in that particular city by managing from Geography category. Why pay for others? How to start with Bidsopt? 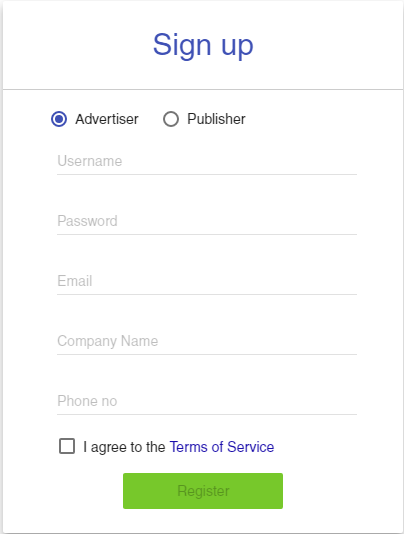 You can start with Bidsopt as a publisher or advertiser. Just follow this Bidsopt signup link and start in a minute. Once done, submit your application. Once your account will be approved, you can start with your campaigns. You can also join Bidsopt as an affiliate and can earn commission on each referral and the amount they will spend or earn. Bidsopt is a leading Mobile Demand Side Platform where an advertiser can reach to their targeted customers and a publisher can earn from it. This is really a great platform if you deal in mobile-based works. We would love to know about your experience if you have ever worked with Bidsopt. Many times you will find publishers of viral sites or downloading sites like songs download or software download etc. complaining that they are not earning much despite having lots of traffic. What can be the reason behind this? Well, if you will ask me then it is either due to the bad ad placement or because of incorrect ad type selection. If you have downloading sites, then I will highly recommend you to start with pop-under ads as these will get high clicks and even if you are getting low CPC, you will manage to earn a good amount of money. Recently, I was checking many ad networks and come across Adnety and found it an amazing pop under network which is trusted by thousands of advertisers and publishers all over the globe. It is a premium ad network, which is delivering daily millions of pop-under ads across the web using a powerful ad serving platform. Adnety is a perfect choice for publishers to monetize 100% of their served traffic and a money making a partner for advertisers which run advertising campaigns on our platform. As I mentioned, Adnety is a pop-under network and the publisher who is looking for a network which can provide popup ads to earn more money should definitely go with Adnety. They have some great advertisers and so you can expect some good CPC from it. • Simple and efficient: the catchy design with the quick menu, helps the user to browse the dashboard in a short period of time. Not only these, you can refer your fellow publishers and can earn 10% of affiliate commission as well on the amount your referred member will earn. Now as you have seen how easy and great this network is if you want to start with Adnety, just fill the signup form and start with it. Once your account will get approved, just generate the code and insert into your site and your visitors will start seeing the ad. Adnety is the perfect partner to work with if you need to run advertising campaigns with full-page pop-under ads. They take care of their advertisers a lot and with the help of their cutting edge technology, stops any kind of fraud that can be done. With the help of above dashboard, you can control all your campaigns, add funds and see the stats. Also, you can add as low as $50 in your account to start with. They support many modes of payment including PayPal. • They work only with genuine publishers who served real impressions on the advertisers’ campaigns. Adnety is one of the top pop under network serving pop-under ads. So if you are looking to monetize your website and earn good money, you should try Adnety for sure. The minimum threshold and good support are some of their USP. Also, if you are an advertiser and would like to reach a broader audience then do try them to get potential customers in pennies.